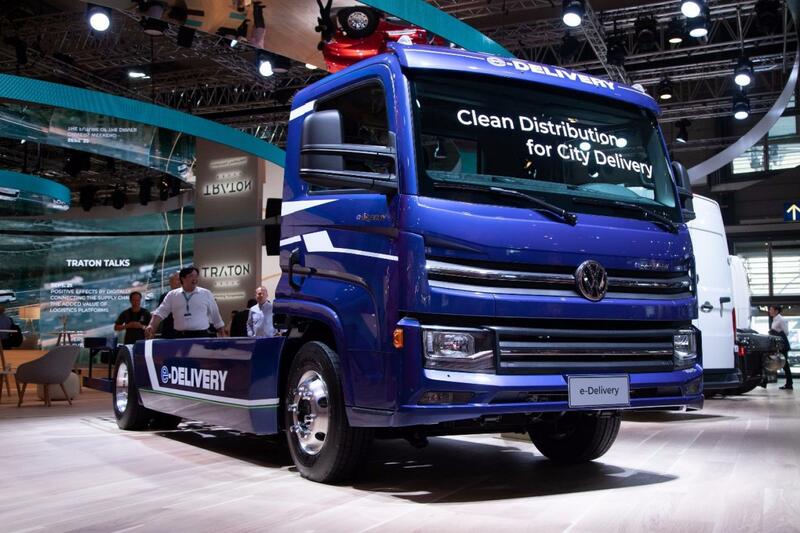 In its first participation as an official exhibitor of the IAA in Germany, Volkswagen Caminhões e Ônibus exhibited the best of Brazilian technology for commercial vehicles and attracted the public in the largest transportation fair in the world. The worldwide avant-premiere of its new electric technologies with the Volksbus e-Flex bus and the e-Delivery truck highlighted what the brand is preparing for the future, while Delivery Express and Constellation 33.440 exhibited the company's extensive portfolio developed as tailor made for nowadays. This was also the first time that VWCO shared space with other TRATON Group brands in an exclusive hall. In addition to demonstrating through the technology in some vehicles, the synergy was also proven through the announcement of RIO platform arrival, part of the group as well, in Latin America in 2019 to offer digital solutions to customers of Volkswagen Caminhões e Ônibus. "This was our ninth participation at the fair, but for the first time as an official exhibitor at the IAA. It is a historic moment for us, as it represents the importance we have gained within the TRATON Group. We are the specialist brand for emerging countries; leader of truck sales in Brazil, one of the largest markets in the world; and we have an engineering with expertise to develop the solutions that society demands from the global transportation industry", says Roberto Cortes, president and CEO of Volkswagen Caminhões e Ônibus. Unveiled for the first time to the market, Volksbus e-Flex ratified VWCO's strategy of investing in electric technologies to help pave the way for the future of passenger transport industry. And it already has a date to debut its sales: the model will begin circulating next year on Brazil’s streets and its serial production is planned until 2021 at the factory of the automaker in Resende. Flagship of the world's largest electric truck acquisition announcement, the e-Delivery presented at the fair a new modular concept to build the vehicle, allowing the configuration of different load and autonomy capabilities, and equipped with electric traction components developed by the TRATON Group for its powertrain. Another attraction that proves the synergy between the group’s brands is the Constellation 33.400, which combines the robustness of MAN’s chassis and engine and the renowned cabin of the VW Constellation family. The solution is about to enter factory tests to serve the sugarcane (taking sugarcane from field to the mill) and forest (transporting reforested wood) segments. Volkswagen’s most powerful model stood in the show side-by-side with the Delivery Express, the lightest in VW family and an outcome of a R$ 1 billion investment cycle, that also showcases the ready to load concept of selling complete vehicles to offer more simplicity to Volkswagen Caminhões e Ônibus’ customers: the vehicle is delivered with an implement, thus ready to load and ready to roll.